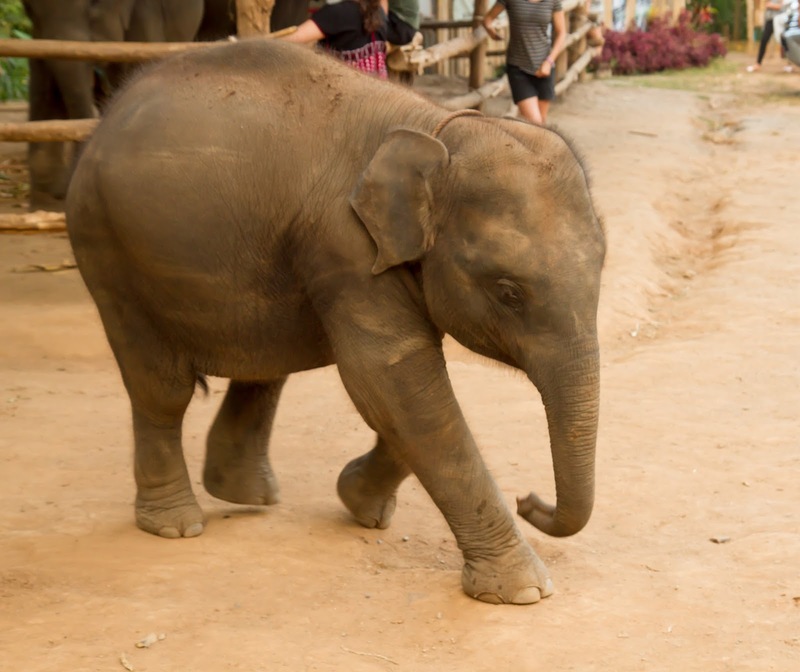 Just before leaving Chiang Mai, Ollie and I finally did the thing that was on the top of our list for must-dos while there -- visit an elephant sanctuary. 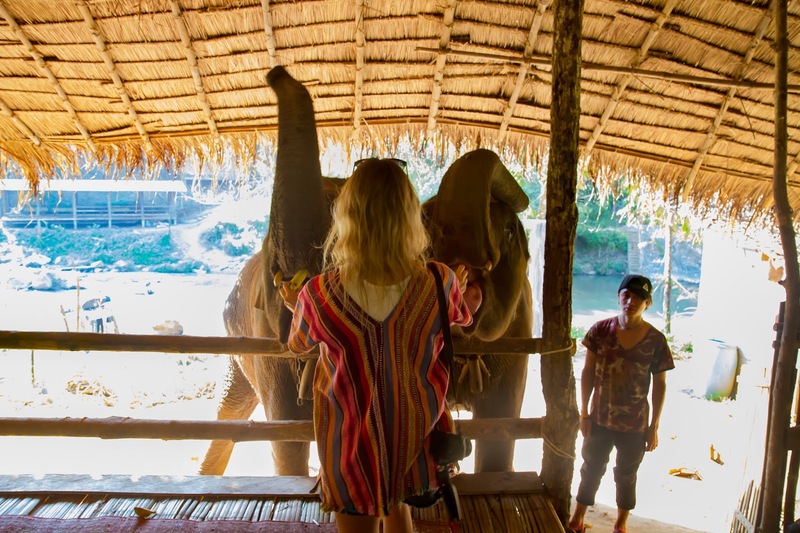 We did a ton of research on the right place for us to visit as it was non-negotiable that the elephants must be treated properly. 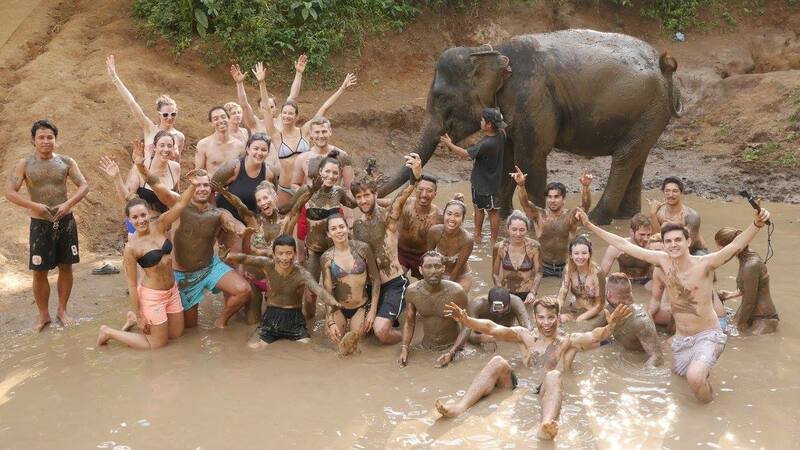 The most popular elephant sanctuary with an amazing reputation is the Elephant Nature Park, however you need to plan a couple of months ahead of time in the high season (which of course we didn't do) so we started looking up the reviews on the other "sanctuaries" around town. 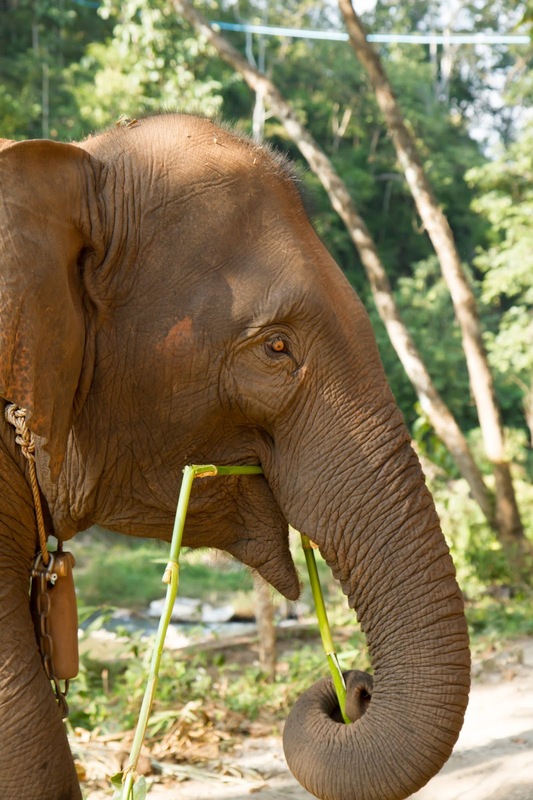 You really have to dig deep to find what you're after because the majority of these places claim to have rescued the elephants from inhumane tourism camps, only to make them perform the same tricks and give rides to the tourists once again. And so, after reading hundreds of reviews and blogs and watching endless videos on YouTube, we settled on the Elephant Jungle Sanctuary. 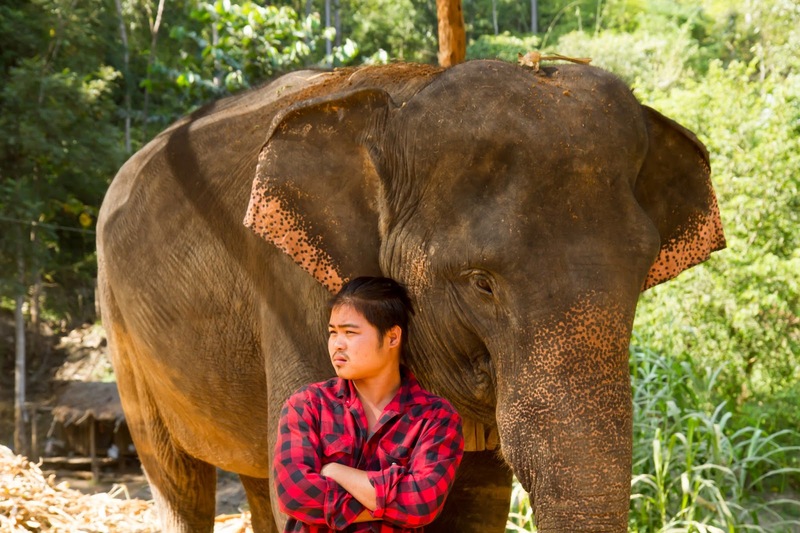 They rescue elephants from all over Thailand -- all of whom had been tortured and mistreated either in riding camps, zoos, circuses or logging camps -- and bring them to EJS to give them a happier life. 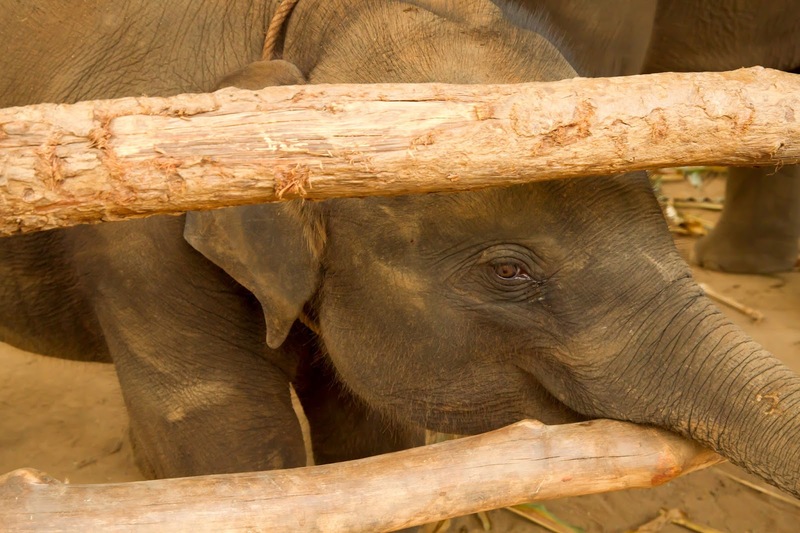 Ideally, they would be releasing the elephants back into the wild, but our guides said this is just not possible as they wouldn't know how to fend for themselves and are so friendly towards humans that they would most likely be re-caught and sent back to the horrible camps they originally came from. 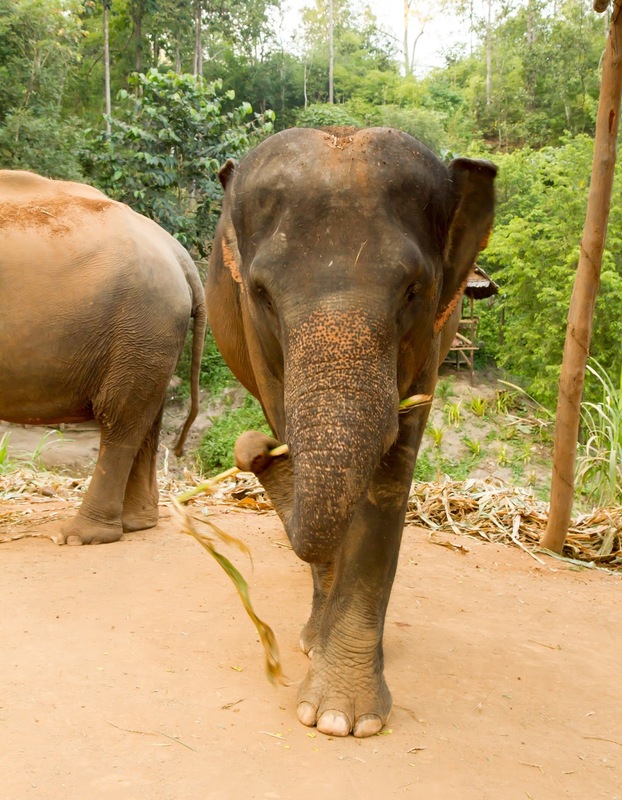 It's hard to know whether the elephants mind remaining in the tourism industry, but at the end of the day, these places need funding in order to feed and care for the animals, and you can tell that they are truly loved and cared for here. Ok, so now I'll tell you about our day there! When we arrived, we were all given shirts to wear over our own clothes in order to meet the elephants. The guide said this was in order to let the elephants know we are friends and they can trust us. Elephants do not have the best eyesight, but they are able to recognize the shirts straight away. I believe they are able to recognize our scents after this, but initially we all wore the shirts. 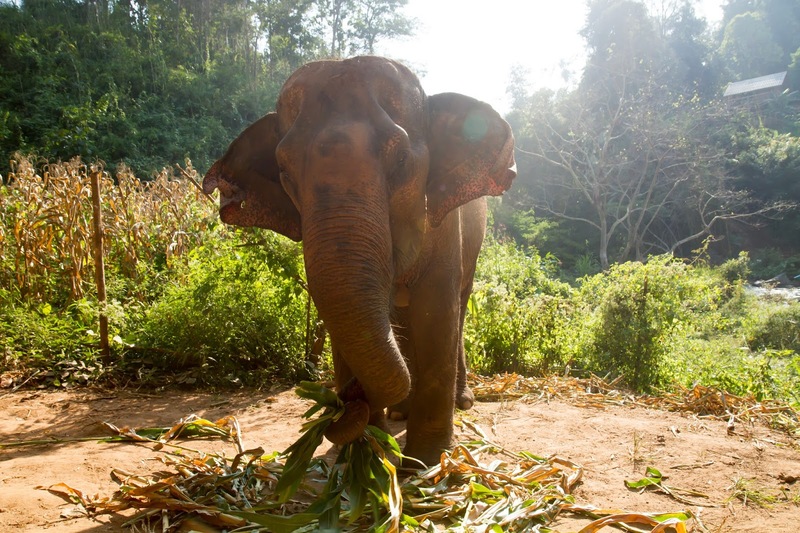 We were then brought over to a huge pile of bananas and told to take as many as we wanted to feed to the elephants. They eat massive amounts of food everyday and a banana isn't exactly going to fill them up, but they view it as a treat or desert and trust me when I tell you they go crazy for it! 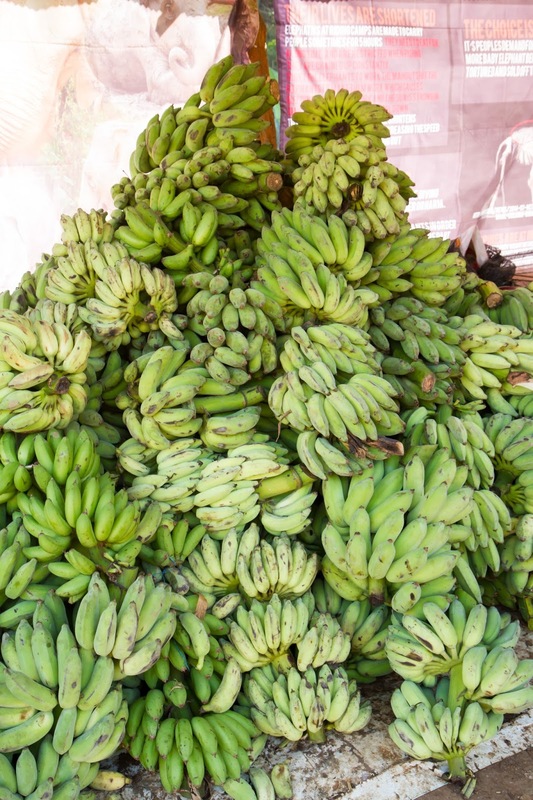 This is actually the thing that convinces me that they don't mind us tourists -- they get to eat soooo many bananas! 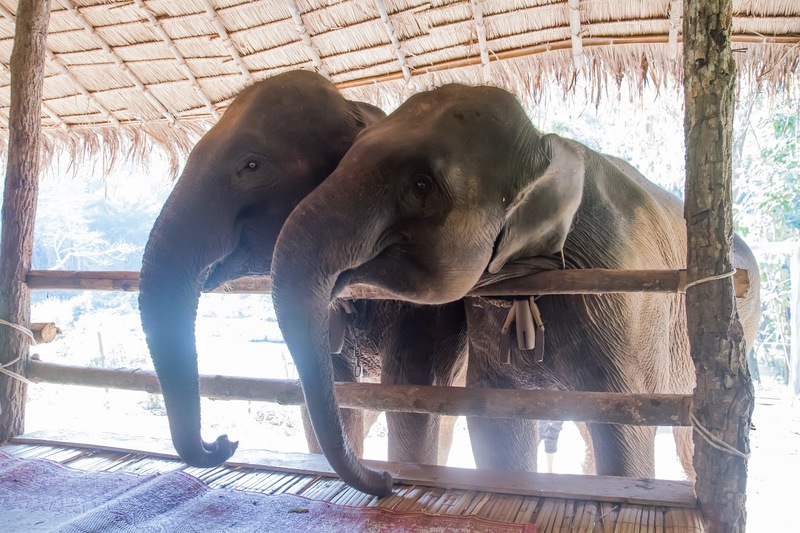 Each of the elephants had their own mahouts (caretakers) that live with them pretty much 24 hours a day. I think this is what I love the most about this system because you can truly see how much these men care for their elephants. The one above always had such a serious face and even though he doesn't look all that happy -- I had the sense that he was protecting his elephant and ensuring that she was treated well. He really started smiling once I asked some facts about her and he got quite talkative. I think she was lucky to have him. 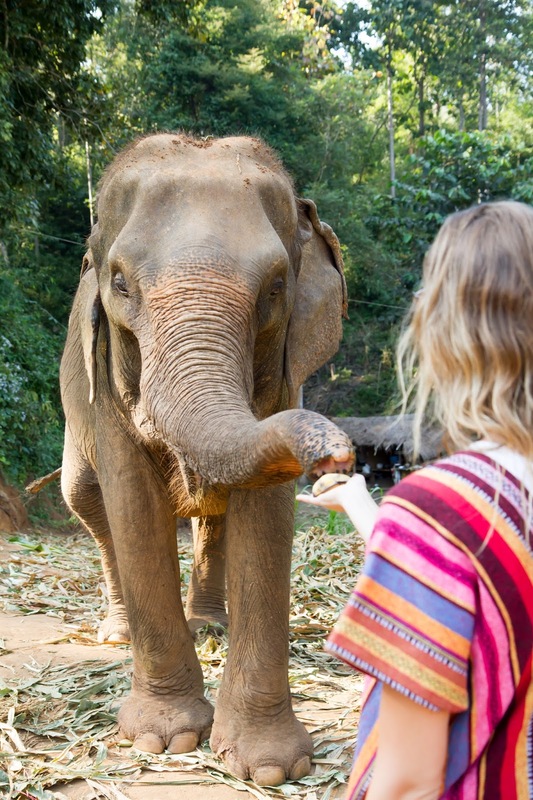 For the next little bit, we went around to each of the elephants to feed them bananas and give them a little cuddle to get to know them. It's actually a little intimidating at first because of how huge they are! I mean, I knew that elephants are big, but you really get a sense of how powerful they are when you're up close. These guys were free to move around as they like, but the mahouts were always keeping a watchful eye to make sure everyone was safe. In this first part of the camp, there were 5 elephants of all different ages -- from 1 1/2 to 43 (I believe) years old. There was a mom that had 2 babies and they were just the cutest things ever. You can see in the photo above that the babies were behind a fence, but they weren't actually trapped in there. The entire back side of it was open -- with just a fence around the front. I had the impression that this was to give the babies some space from all of the tourists vying for their attention. Their mother was very protective as well so she may not have liked too much attention on the little ones. After feeding those elephants for a good 20 minutes or so, we went across a river to see another 3 elephants they have at this camp. This time there was a 72 year old Grandmother (of the little babies) and 2 teenagers that were full of energy. The grandmother was very slow and gentle while the two teens rushed right over while trying to get in front of the other to get the coveted bananas we had. They ended up falling into sync with one another and it was amazing to feed them both at the same time. They were so excited to get those bananas! 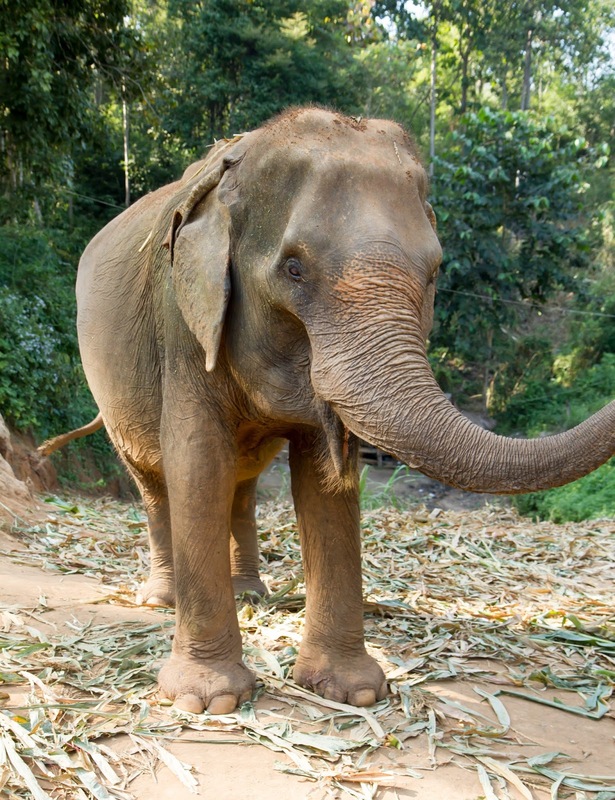 Once we ran out of bananas, the elephants lost interest in us and went on to feed on their real source of sustenance -- bamboo shoots and leaves -- which apparently they eat hundreds of pounds of each day. It's so crazy to watch how good they are with their trunks! Make sure to check out my video below to see for yourself. 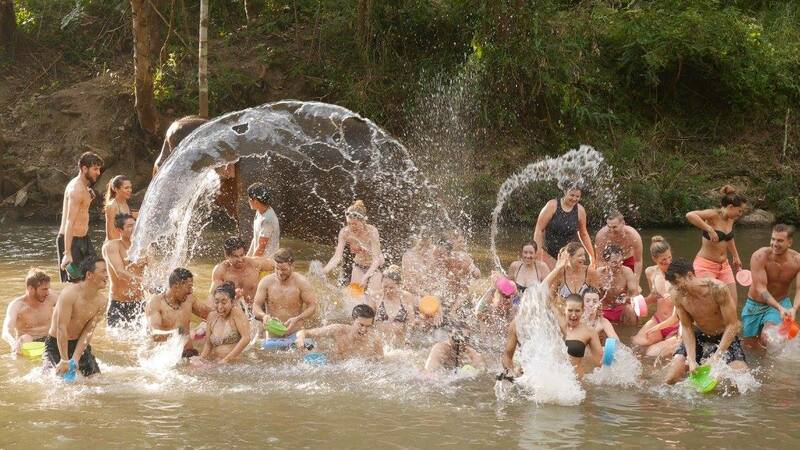 Next was the fun part that I could get into and that was washing the elephants off in the river. It was so cute watching the babies roll right under the water and play with each other while their mother kept a close watch and a constant trunk on them. I stuck mostly with the older gals because they were getting less attention but needed a good scrub too! After the fun in the water and a delicious meal the staff prepared for us, we said our final goodbyes to the elephants. The baby was getting quite mischievous at this point and kept finding opportunities to sneak out from the fenced off area. The mahouts would laugh and chase them back -- turning in into a game of chase the leader for the little ones. I think this was my favorite thing about the day -- seeing babies being babies, teenagers being teenagers, mothers acting maternally and grandmothers taking a backseat to watch over everyone around them. The dynamics are so human-like, you can't help but feel a connection to them. All in all, it was such an amazing day and I couldn't be more grateful to have experienced it. We can't know what the elephants are thinking about their current situation, but I can only hope they are as happy as they appear to be. It seems that Elephant Jungle Sanctuary is giving them the happy life they deserve and that makes me very glad indeed. Make sure to check out my video from this day to see what it was like at the Elephant Jungle Sanctuary and hear my thoughts on our experience there.